Solder bridging is a defect that commonly occurs during reflow of BGA devices. 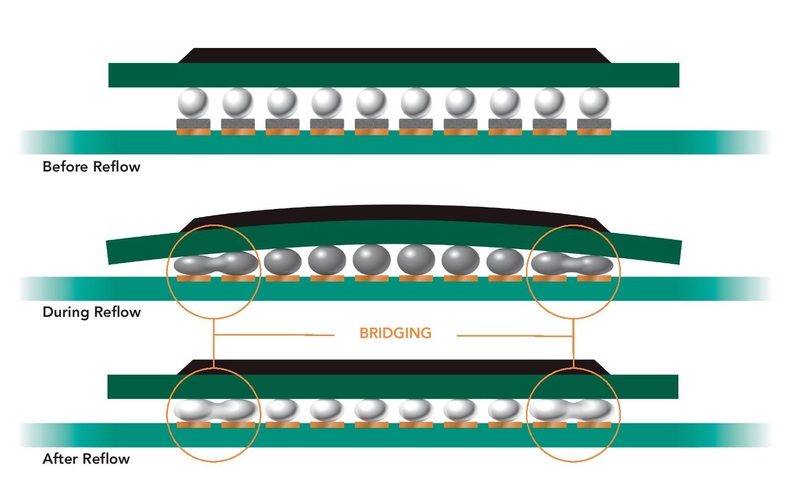 The BGA device can warp during reflow causing adjacent BGA spheres to come in contact and form a solder bridge. The BGA spheres located in the corners of the device are most susceptible to this phenomenon. In some cases solder bridging can be overcome by adjusting the reflow profile or repositioning the device on the PCB. However, in many cases neither of these solutions rectifies the problem forcing manufacturing to live with the DPMO yield. During the liquidous phase, solder is squeezed and forms a bridge due to either substrate warpage or component weight. “frowning.” Frowning over-compresses or pancakes the solder spheres. Solder bridging occurs when these compressed spheres come in contact with one another during the reflow process. This is especially common in the corners of the BGA. Use a precision spacer block on the 4 corners of the BGA device to maintain a minimum standoff height and prevent solder bridging. Contact the Alpha sales team to learn more about Precision Spacer Blocks. Maintain minimum stand-off height, allowing solder to form a more spherical ball and prevent bridging. 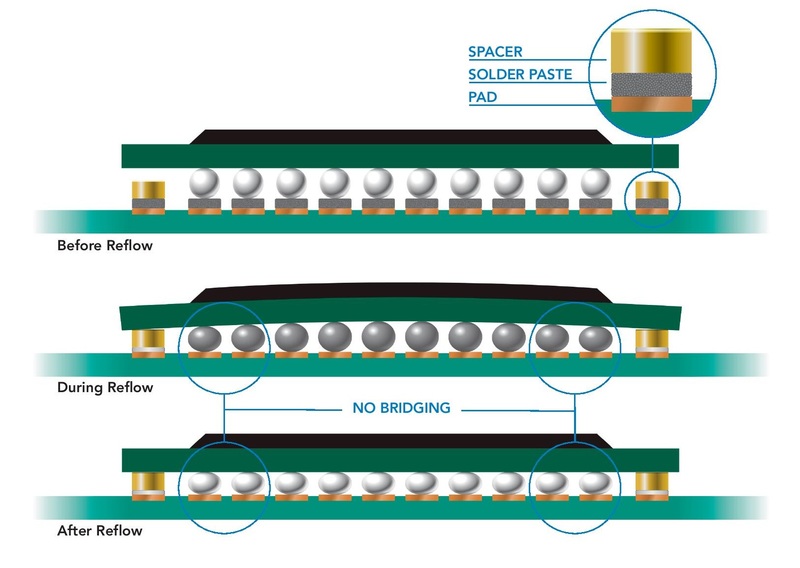 To learn more about ‘Elimating Solder Bridging in BGA Devices’ download the Alpha TrueHeight Spacer Block Product Guide.